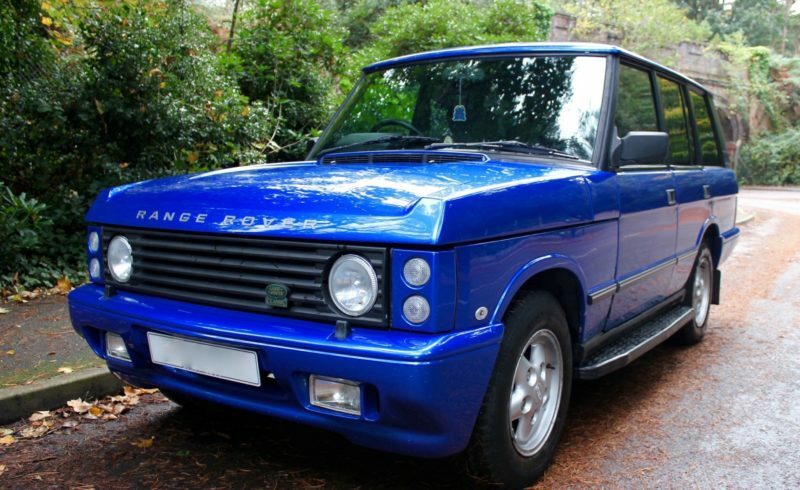 We are told this was a custom order by the first owner to be painted in Trophy Blue, all of the doors and engine bay are the same colour and we were told this was carried out by Land Rover. The paint work is a very deep blue and is a very nice job. There are a few places where the paint has started to corrode on the aluminium panels over the wheel arches. It has had a recon 300 TDI Fitted by Land Rover at 105k now covered 162,000 miles, so under 60k on the new engine. The engine is mated to the 3.9 Auto box. It drives beautifully and pulls like a train, a very easy drive with the auto gearbox. It had a new Alternator fitted a couple of months ago with a lifetime warranty. It has discovery alloy wheels with good tread on the tyres, It gets a lot of attention everywhere it goes. It really stands out. It has had quite a lot of restoration work over the years, The whole floor was replaced a couple of years ago with thicker gauge steel. The last mot it required a small amount of welding in the rear arches. It is very solid now underneath with none of the usual range rover rust issues. There are a few bits of paintwork that need tidying up but that is it. I have been using this car as my daily driver and it has been flawless. Starts up on the button every time and drives great. It has 10 Months Mot and is ready to go.